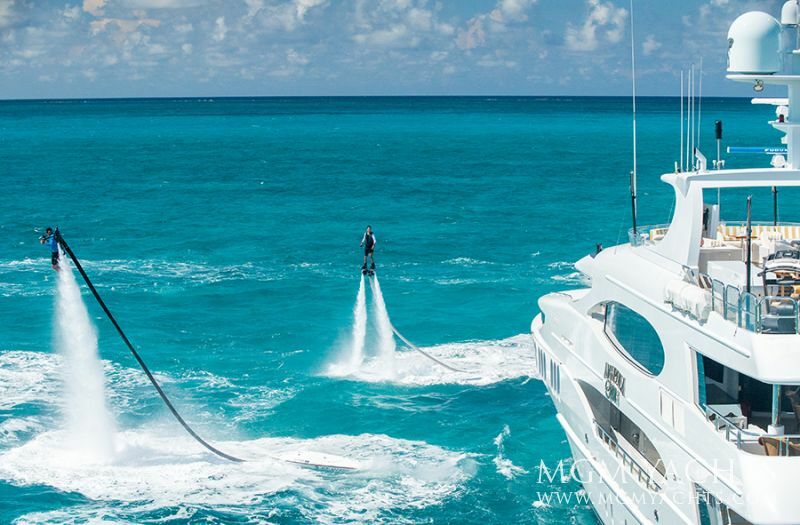 This charter yacht is listed in Mega Yachts. 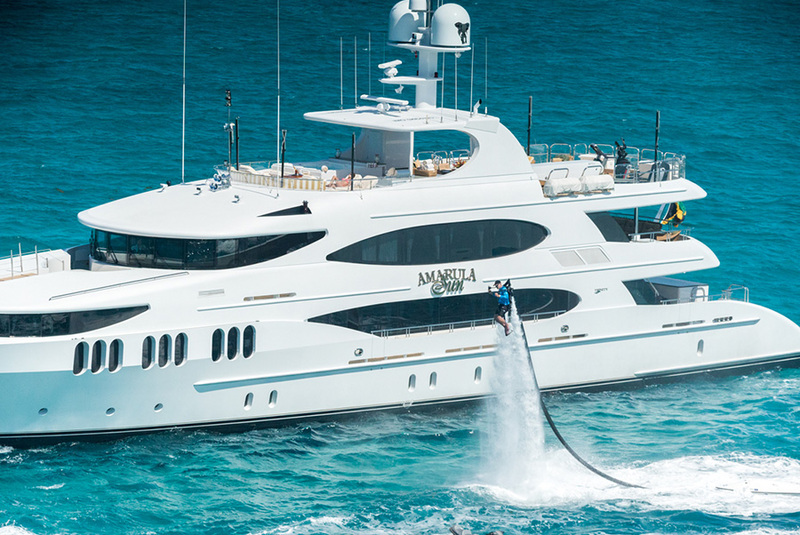 AMARULA SUN Charter Yacht is a Custom built 164 ft. Mega Yacht by Trinity Yachts that accommodates up to 12 Guests in 5 Staterooms. 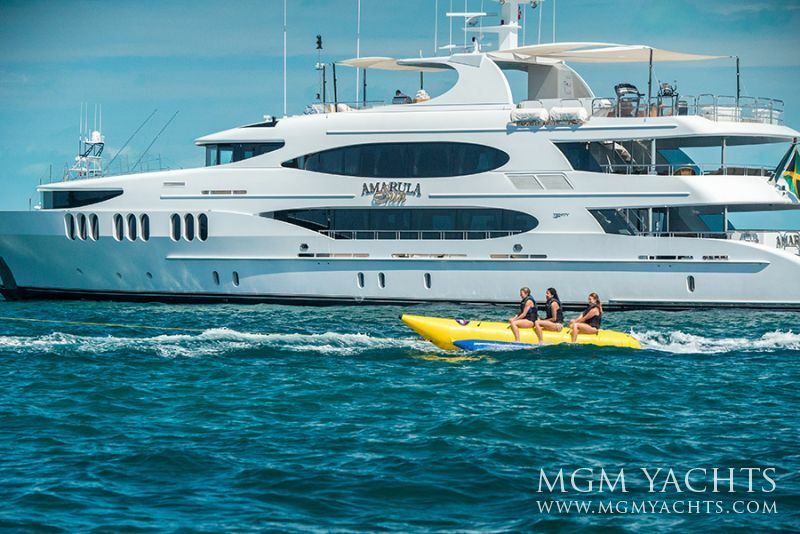 AMARULA SUN costs in high season: $ 230000.00 and low season: $ 195000.00 for a 7-days yacht charter + expenses. 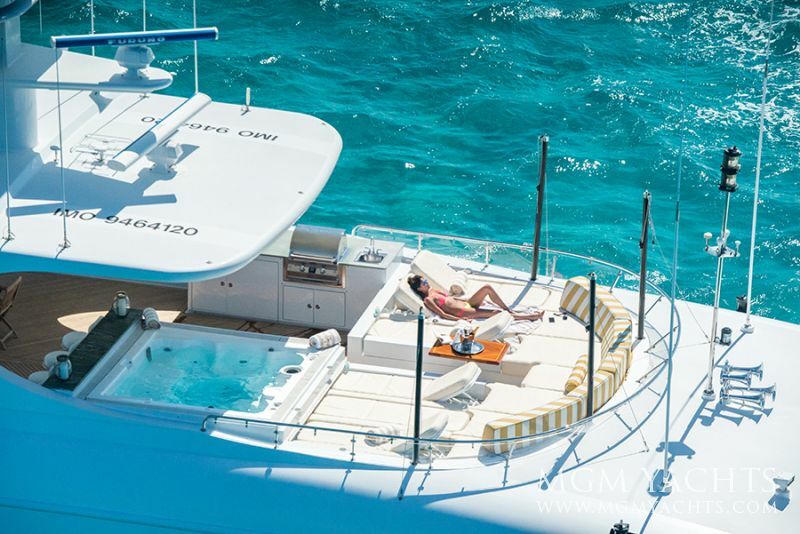 Winter season chartering destinations includes, Bahamas, Caribbean. As you board AMARULA SUN you will be struck by the beauty and charm of the design. Hand polished American Cherry, Figured Bubinga and Maple Burl creates a warm feeling in the formal dining room that seats 12 guests. 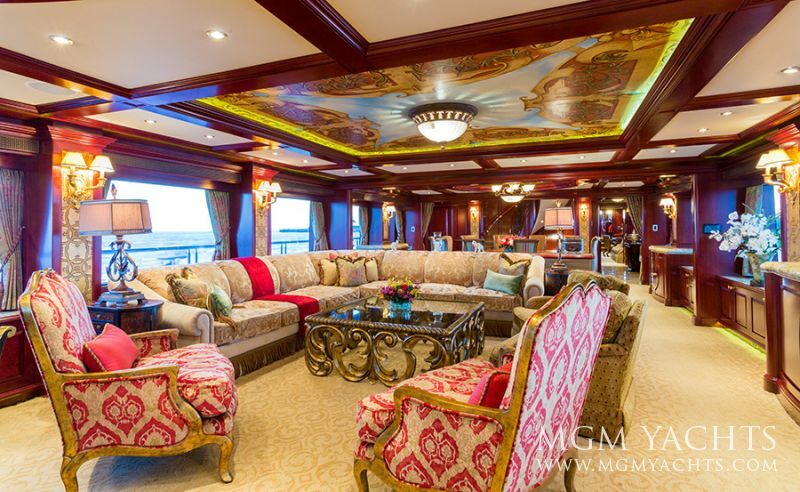 The open floor plan of the formal dining room and main salon gives the ship a comfortable spacious feel, while the rich colors and textures of the interior design add to the unique blend of sumptuousness and comfort. In the main salon there is also a plasma television entertainment center and plenty of seating for you and your guests. In pure relaxation, comfort and luxury AMARULA SUN can host a group of up to 12 guests. 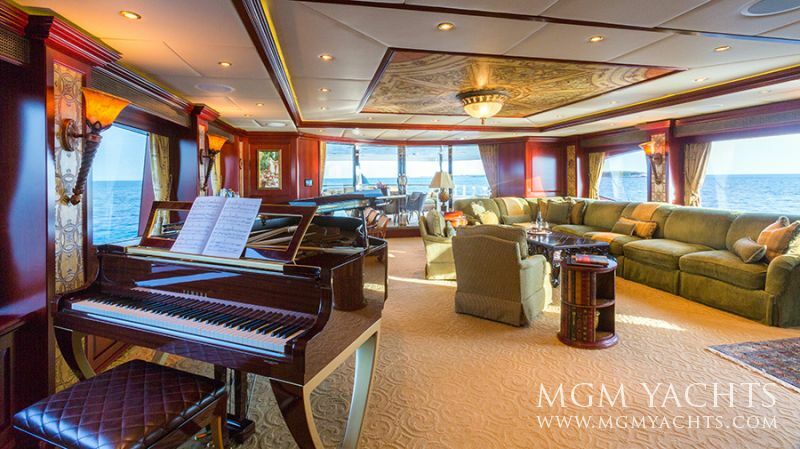 While on this chartered yacht, guests enjoy stops and swimming on gorgeous tropical beaches of the Bahamas or Caribbean or, while in the Mediterranean stop and visit the casinos if you like to play the tables. AMARULA SUN’s crew stands ready to take care of your every need as you cruise to some of the most beautiful places on the planet. See more images of Amarula Sun. A VIP cabin has a king size bed, bath/tub, shower and toilet. A Guest cabin has a king size bed, a pullman, shower and toilet. A Guest cabin has a king size bed, shower and toilet. AMARULA SUN is a non-smoking vessel and guests are not allowed to bring pets on board. 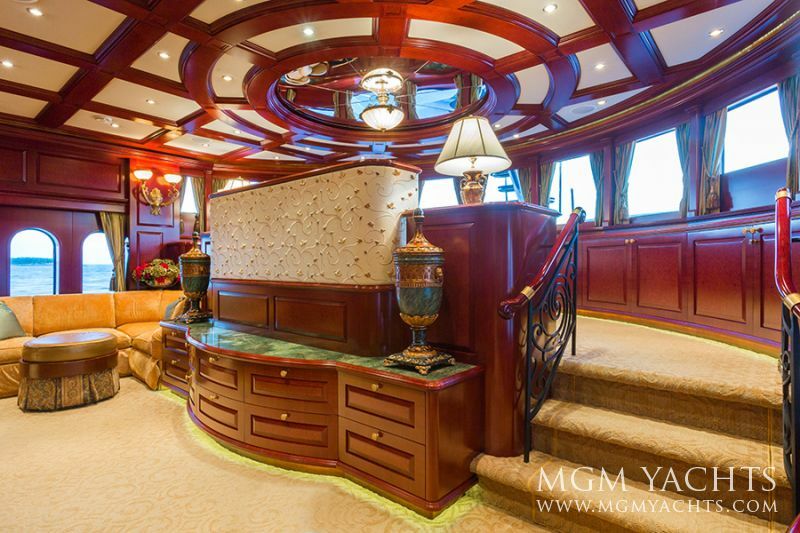 Some of her many features include hand-forged black iron railings with gold accents, intricate marble medallions at the aft salon entry and under the dining salon table, and many other stone elements throughout her interior. There are also hand-painted murals on the overheads of the main salon, dining salon, and skylounge. 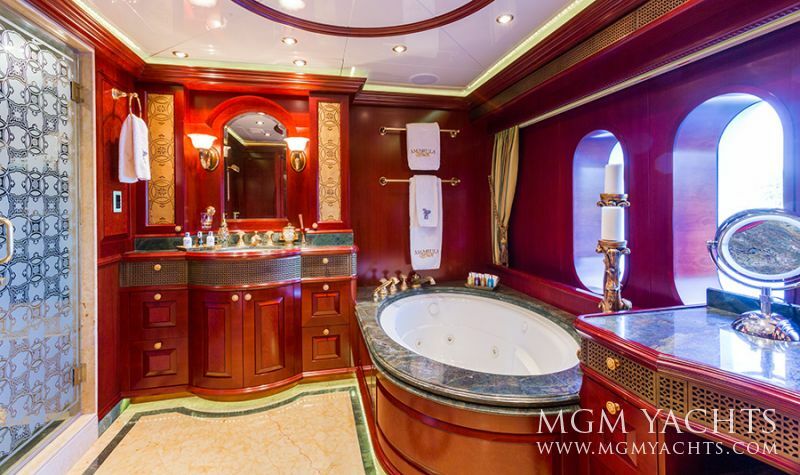 The main deck powder room has a hand-painted wall mural and an exquisite custom marble floor. 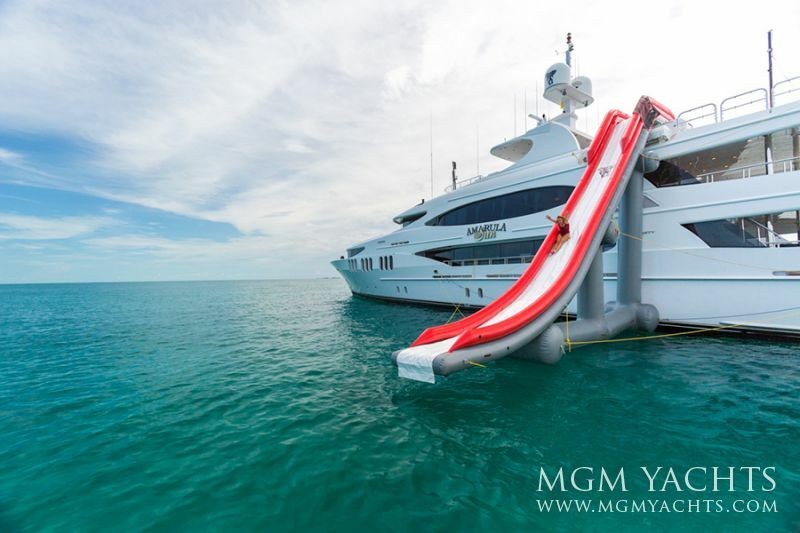 The very large swim platform provides easy boarding and turns into a beach area for easy access to the ocean waves. 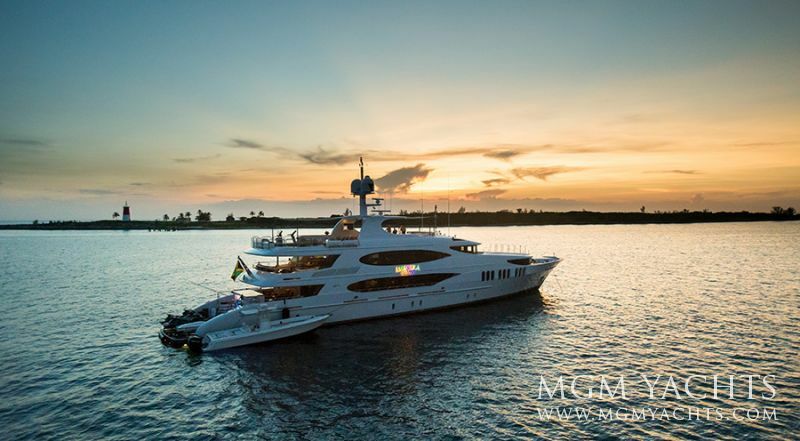 The port and starboard extra wide stairs lead from the swim platform to the air conditioned main aft deck which is the perfect setting for alfresco dining for 12 including a wet bar. 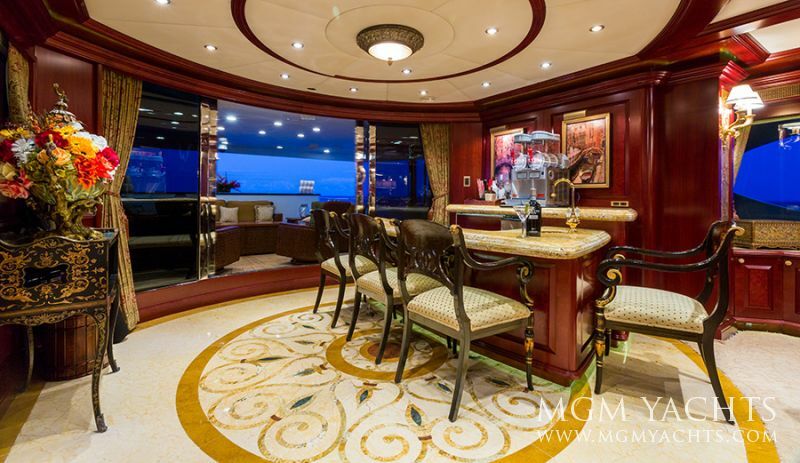 Entering the main salon from the main deck aft there is a bar and large sitting area with an “L” shaped couch with 2 overstuffed chairs and 2 additional side chairs. Forward of the main salon is the dining salon with large round table that comfortably seats 12 for formal dining. The large windows and accent lighting complement the warm wood tones in these two areas. 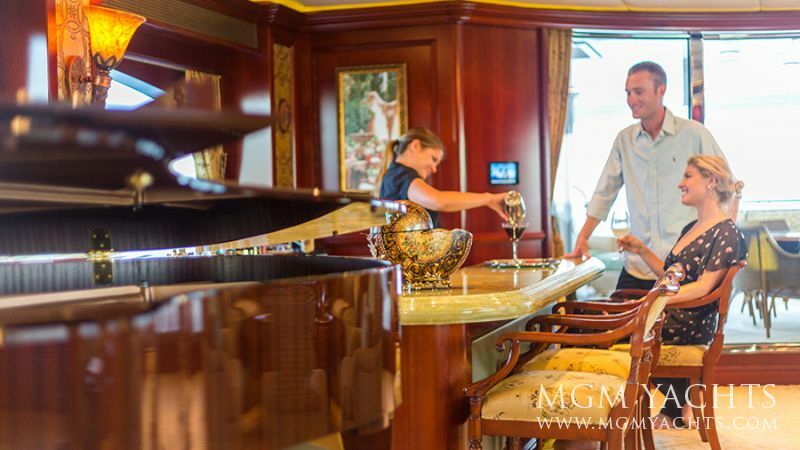 The well-equipped galley is located forward port from the dining salon and is where her masterful chef will prepare delectable creations tailored to the tastes and preferences of your group. 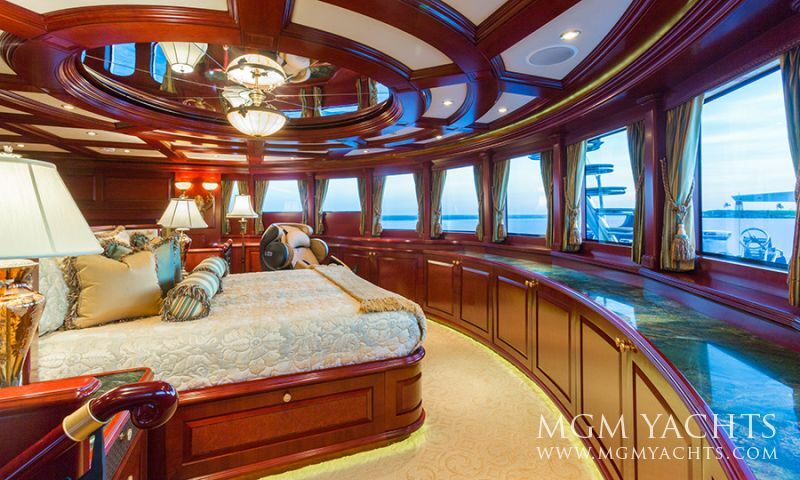 The split-level full beam master stateroom is located forward on the main deck and features an impressive 180-degree panoramic view from the bed with a separate and spacious master suite lounge on the lower level, with a 42″ Plasma TV and his-and-hers bathrooms. 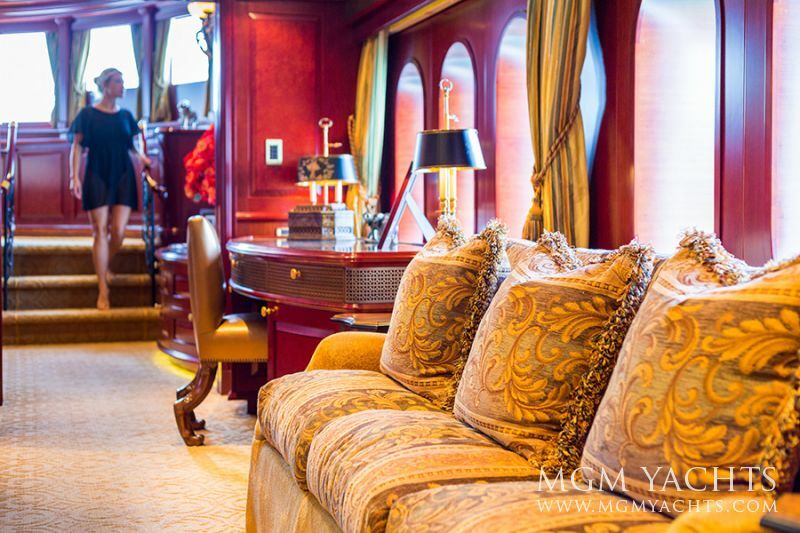 Four guest suites, 3 with king beds and 1 with twin beds, are on the lower deck of the yacht. The more casual skylounge on the upper deck includes a bar, game table, and features a surround sound theater system utilizing a 60″ Plasma TV with CD, DVD & Sat-TV. There is a day head to starboard. 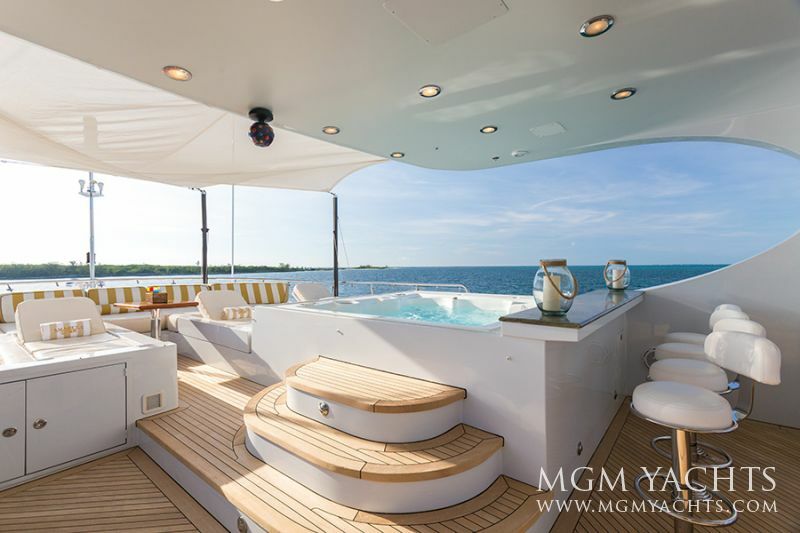 The skylounge opens out onto a covered aft deck through two electric sliding doors. 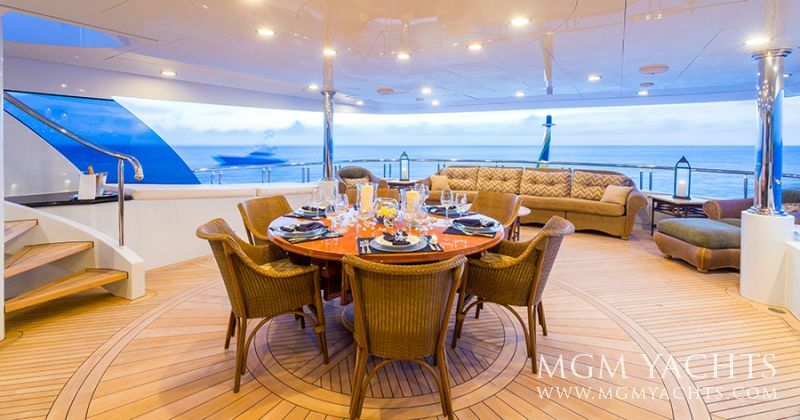 The aft deck has a unique powered hi-low round table with expanding leaves that are stored under the tabletop when in the retracted position. 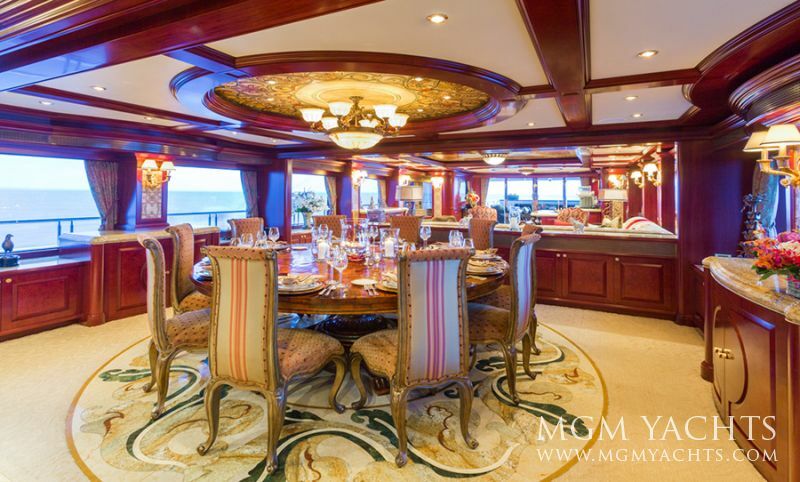 The aft deck offers formal dining for 12 guests, ample casual seating, as well as a 60″ Plasma Sat-TV. (All TV’s have Kaleidescape/DVD/CD/Sat TV). The sun deck is perfect for sun bathing and lounging. 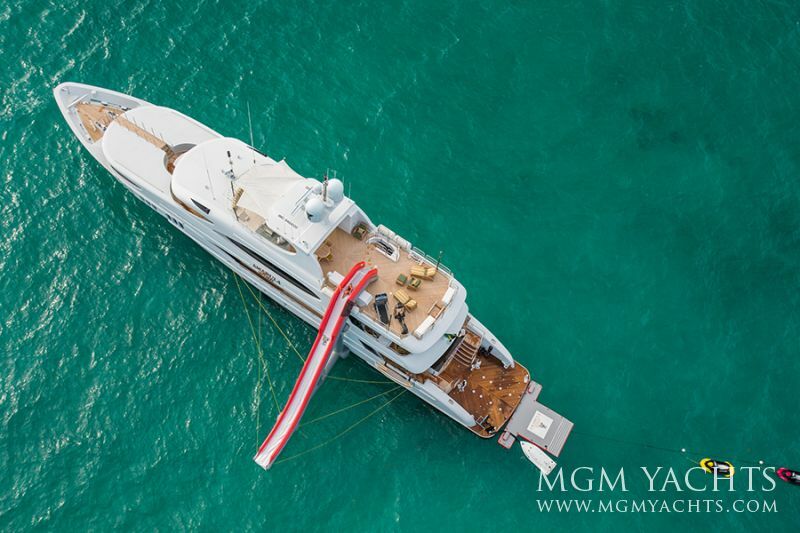 It features a hot tub for eight with an adjacent bar, a barbecue, an enormous sunpad, and a teak table for more casual dining. 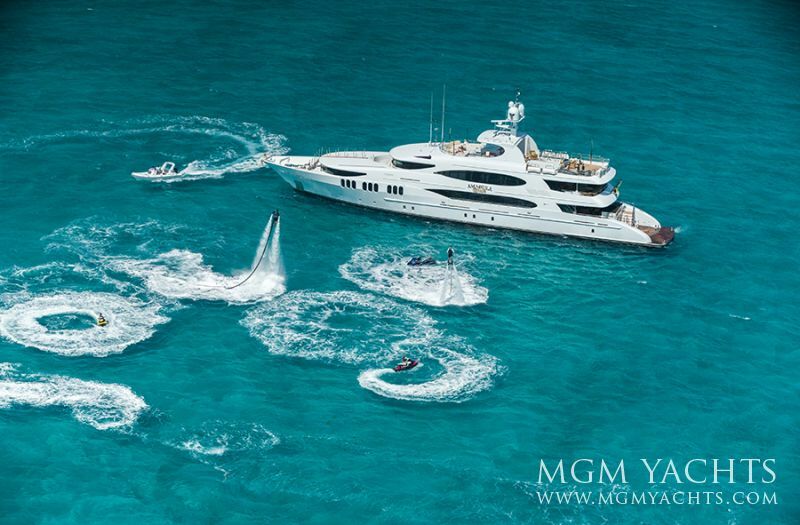 To charter this luxury mega yacht, contact us for more details.